This tutorial will show you step by step how to copy a CD to another blank CD on a PC with only one CD/DVD drive – in a few different ways using free and paid software. If you don't want to risk damaging your favorite CDs, then it's a good idea to make copies of them, store the originals in cases and only use the copies. In order to duplicate a CD, you'll need a computer with a CD burner drive and a blank CD. Tip: If you want to copy an audio CD, then use a blank CD-R and not CD-RW, because not all CD players and car stereos can play rewritable CDs properly – even when burned in the correct audio format. Most desktop computers and especially laptops have only one CD burner drive, so that's why the tutorials on this page are for copying CDs on PCs with only one CD burner drive. 1. Insert the CD you want to copy into the CD burner drive of your PC. Your PC will now eject your disc. 6. Take out your disc and insert a blank CD into the CD burner drive of your computer. 8. Click on the Write CD button located at the bottom right. Ashampoo Burning Studio will now burn the copy of your CD to your blank CD. 7. Click on the Write CD button at the bottom right. Nero Burning Rom is a well-known CD/DVD burning program which allows you to burn and copy all kinds of discs easily and quickly. If you want more information about the new version of Nero Burning Rom, then click here. A new compilation window will appear. If the new compilation window does not appear, you click on File at the top left and then choose New from the drop-down menu. 4. Click on CD Copy. 5. Click on the Copy button. Nero Burning Rom will now read and analyze your CD and when it's done it will show a CD Information window. 6. Select your CD in the CD Information window and click on OK.
Nero will now create an image for burning your CD and when it's done, your computer will eject your disc. 7. Take your CD out and insert a blank CD into the CD burner drive of your PC. Nero Burning Rom will now burn the copy of your CD to your blank CD. CDBurnerXP is a good and user-friendly free CD/DVD burning program that allows you to burn and copy all kinds of discs. 3. Select Copy or grab disc and click on OK.
A Copy Disc window will appear. 4. Click on Copy disc. 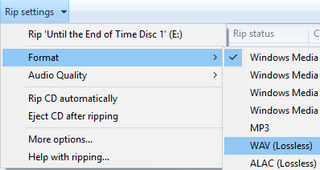 CDBurnerXP will now extract the content of your CD and when it's done it will eject your CD. 5. Take your CD out and insert a blank CD into the CD burner drive of your PC. CDBurnerXP will now burn the copy of your CD to your blank CD. This tutorial will show you how to copy the songs from the CD to your PC and then burn them to a blank CD using Windows Media Player. Using Windows Media Player for copying music CDs is a good option for people who don't want to install and use any extra CD burning software on their Windows PC. 1. Insert the audio CD you want to copy into the CD drive of your PC. 3. In the left section of Windows Media Player, you click on your CD (e.g., AlbumName (E:)). 4. Click on Rip Settings, go to Format and then choose WAV (Lossless). 5. Click on Rip CD. Windows Media Player will now rip (copy) the songs from your CD to your PC. 6. When Windows Media Player is finished ripping your CD, you take out your CD and insert a blank CD into the CD burner drive of your PC. 7. Click on Burn at the top right. 8. 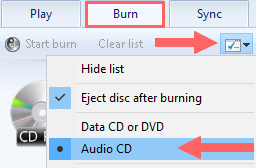 Click on the burn options icon and make sure that Audio CD is selected. 9. In the left section of Windows Media Player, you click on Album. 10. Right-click on your album, go to Add to and then choose Burn list. 11. Click on Start Burn located above the Burn list. Windows Media Player will now burn your Audio CD. This CD can be played on any CD player. iTunes is installed on any macOS computer by default and is updated through the App Store. You can download the Microsoft Windows version here. 2. Insert the CD you want to copy into the CD burner drive of your computer. 3. Click on Import CD. 4. At Import Using, you select WAV Encoder. iTunes will now rip (copy) the songs from your CD to your computer. 6. When iTunes is finished ripping your CD, you take out your CD and insert a blank CD into the CD burner drive of your PC. 7. Right-click on your album, go to Add to Playlist and then choose New Playlist. 8. You can enter a name for your playlist or keep the name of the album. 9. In the left section of iTunes, you right-click on your playlist and choose Burn Playlist to Disc. A Burn Settings window will appear. 10. At Preferred Speed, you can choose a burning speed. 11. At Disc Format, you make sure that Audio CD is selected. 12. You can also select a gap (pause) between songs. 13. Click on the Burn button. iTunes will now burn your Audio CD. This CD can be played on any CD player.